Retail: $570 FOR HAIR ONLY! This unit has lace front closure, knots bleached and plucked for a middle part. You can change the part by simply moving the wig or changing the part yourself. 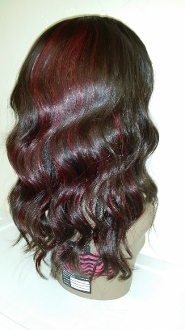 It has 1 bundle of Russian Red Luxe Collection and 2 Virgin bundles.